According to smallbusiness.co.uk, 120,000 UK business self storage units are being used by online businesses. The latest evolution of the industry – mobile business self storage – is even better suited to some online retailers, particularly online startups where the business is a sideline or the owner is unable to access their own transport. The main difference between mobile self-storage and the traditional model is transportation. 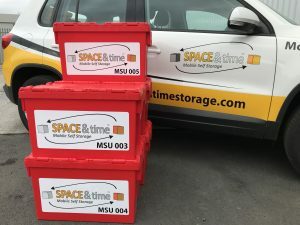 With Space and Time, rather than having to organise hiring a van to move business stock or other items into storage, the business owner can arrange for a delivery of self-storage units, boxes and packing materials. Once the units have been filled and secured, the self-storage company will collect them and take them away for safekeeping. Whenever the stock or items are required back they can be returned to the same or a different UK address. Space and Time can even ship items internationally if needed (e.g. if you are running a promotion overseas). The alternatives to mobile self-storage tend to be less economical. Small businesses running from home may have to operate with reduced stock which can lose them orders and cost them more (as they are unable to benefit from bulk order discounts). Standard business rates are a lot more than self-storage rates and renegotiating a lease may be a problem should your needs change. Traditional self-storage is an option but the cost of hiring vans whenever you need to store, retrieve or check on items is significant. It is also very easy to book too much warehouse space and end up wasting money when business slows. Mobile business self storage is not just beneficial for holding excess or out of season stock. Online businesses can also use it to store any paperwork such as tax receipts and invoices. This offers cost-effective offsite storage which will protect important documents from destruction should the worst happen and your home office be damaged by fire or flood or broken into. Mobile self-storage is generally a lot more flexible than other forms of extra storage. You can normally book storage for short periods (e.g. Space and Time allow you to book for as little as 4 weeks online). 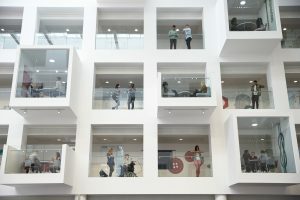 This means that you can scale up and down with business demands. You can usually store a wide range of business items in self-storage units from furniture and equipment to excess stock to promotional materials. Online startups can take a while to find their feet and business performance can be erratic at first. This level of flexibility can be the difference between survival or collapse. If you have an online startup and are ready to book some storage space, simply visit the home page and click the ‘Get Started’ button. The nine-step online booking process is easy to follow and you get a live update on the total price, enabling you to tweak parameters until you get the deal you want. You will be able to select the date and time slot for delivery of your mobile storage units together with the date and time you want your units collected. Then you can just sit back and wait for your packing kit to arrive. With our national network of secure facilities, drivers and vehicles we can serve your business wherever it is located in the UK. If you need more information, please don’t hesitate to contact the friendly Space and Time team on 0161 207 1260.